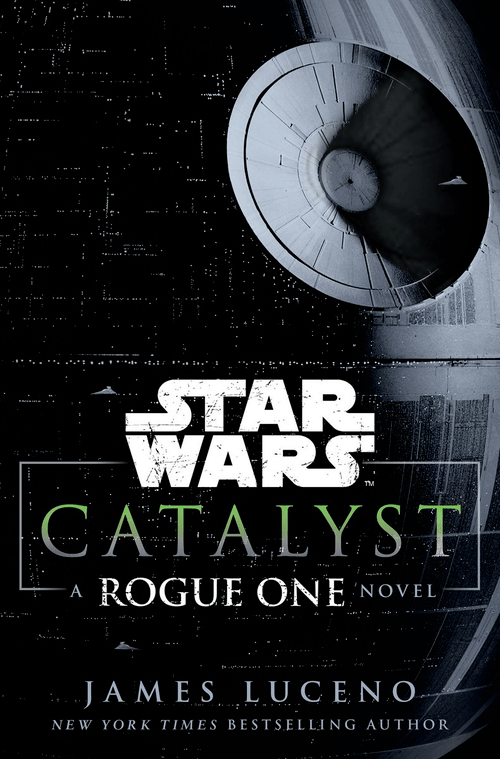 Catalyst: A Rogue One novel is a book about Galen Erso, brilliant scientist and the leading authority on extracting power from crystals in the galaxy. It is a book about his friend Orson Krennic, attempting to use Galen’s mind for his own selfish needs. It’s a book about Lyra Erso, wife to Galen and mother of Jyn, actively undermining Krennic at every turn. It is a book about Has Obitt, rogueish Dressellian smuggler caught in the middle of power games he wants no part in. And it’s a book about a plethora of other characters, including Tarkin, Mas Amedda, Poggle, and Saw Gerrera. But mostly, it’s a book about the Death Star, aka Project Celestial Power (try reading that without hearing Mendelsohn’s voice!). We follow the battle station from its beginnings as a captured Separatist schematic to a nearly fully operational behemoth. Along the way we learn just how massive the operation is, and how Palpatine kept its true purpose from the public. The Death Star really is a character in this book, and it might actually be the one with the most character building.. if only literally. The actual (near-)human characters are great too, though. Galen is a warmer person than you’d expect a Mads Mikkelsen character to be, Lyra is someone whose bad side you don’t want to be on, and Has Obitt will have you checking every inch of the Rogue One trailers for Dressellians (spoilers: I haven’t seen any..). But the true show stealer is Orson Krennic. There’s a scene in a Republic meeting early on that has him pondering the lengths he’ll go to get closer to chancellor Palpatine. This immediately demonstrates his most important characteristic, his ambition. There’s also an element humour to his threatening presence, and his scenes with Tarkin are pure gold. Krennic has been one of my most anticipated characters since his announcement, and Catalyst only adds to that. It does tie in to my biggest criticism of the book though. It may be a complete story in its own right, but the book definitely gains a lot of momentum from being a tie-in to the upcoming film. Which is entirely the point, of course, and right now I consider it one of my top five canon books. However, I anticipate it losing a lot of its relevance once the movie comes out. I highly recommend those planning to read the novel to do so before they see the film. A mere month to complete a book may sound daunting to the slower, more deliberate readers among you. Thankfully, it’s a much faster read than Luceno’s earlier work. And even at points where the plot doesn’t progress awfully fast, you’ll be too invested in the characters to realize. Overall, Catalyst is a solid addition to the saga and a great way to bridge the gap to mid december. There may be an expiration date on its relevance though, so the term “get it while it’s hot” definitely applies. I recommend picking it up as soon as possible… Then getting online and discussing it with little old me on Twitter.